We’d love your help. 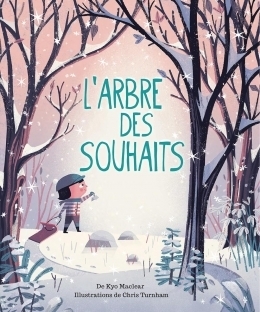 Let us know what’s wrong with this preview of L'arbre des souhaits by Kyo Maclear. Le texte poétique et des illustrations chaleureuses réussissent avec brio à Charles aimerait tant trouver un arbre de souhaits! Même si son frère et sa soeur ne croient pas qu'une telle chose existe, il saisit son toboggan et part à l'aventure. Sa route sera semée d'expériences merveilleuses qui lui feront découvrir que les souhaits se réalisent parfois de façon inattendue. To ask other readers questions about L'arbre des souhaits, please sign up. 4 most IMPORTANTLY, the character doesn’t believe them and sets out anyway. 7 The wish is granted. I love the artwork in this book. I love that the child calls th I love stories like this. I love the artwork in this book. I love that the child calls the sled Boggin and it has a bit of a name and that we can see the boys journey from the trail left in the snow. I love the animals that are meet in the woods. I adore the ending. This book touches that magic place inside me and my heart blooms. Sweet, quiet story of a young boy looking for a wish tree. Though he walks all day, he doesn't find it. He does, however, help a number of animals and their families haul berries and other forage home with his toboggan. the art work was lovely, delicate was used in a previous review and that word is perfect. I thought the story just a bit confusing close to the end. I adored how his friend was the toboggan. I thought this was a very attractive brook. The cover is lovely and the inside art features adorable animals. There's red squirrels, bear and cub, beaver, birds, foxes, owls, and mice and they are so darn cute. The story isn't precisely clear which is part of the fun. It starts with a little boy named Charles. He wants to find a wishing tree so he asks his sister and brother. The two older siblings just brush him off, saying there is no such thing. That's when he asks his toboggan what it thinks. You can tell that the young boy has a working and friendly relationship with 'Boggan' because it says that surely there must be such a thing. And so they set out. They climb hills and then slide down. They are looking for the Wish Tree as they go, but they get distracted by the needs of others. The red squirrel, for example, needs help to get it's nuts to the tree and we see Boggan loaded with nuts and the resulting happy squirrels nestled in their tree with plenty of treats. Boggan and Boy continue to help animals until it starts to get dark, then they head home. Before they get there, the boy falls asleep and the animals appear. It's not entirely clear whether the events that follow are dream or not. I'd be tempted to spin the story one way or another at different times to see what children think. Older children can, of course, be urged to give their own interpretations and you can then look to see if there are clues in the artwork. L’ARBRE DES SOUHAITS m’a énormément charmé. Les illustrations sont, bien sûr, jolies tant elles sont colorées et même assez… douces. Cependant, c’est réellement l’histoire et le personnage principal qui ont fait rebondir mon cœur. Alors voilà ce qui se produit: Charles veut trouver un arbre de souhaits. Tout son entourage lui dit que, franchement, ça n’existe pas ces choses. Mais Charles persiste, et donc, son traîneau et lui vont dans la forêt afin de chercher ce bel arbre. Si je n’avais pas lu L’ARBRE DES SOUHAITS m’a énormément charmé. Si je n’avais pas lu le livre pour enfants WISHTREE de Katherine Applegate, j’aurai cru que ces arbres n’existent vraiment pas et que tout ce qui se passe dans cette histoire provient uniquement de l’imagination de l’auteur. Mais non, ces arbres sont réels dans certains endroits. Je n’en connais pas à Montréal ou dans mon coin, malheureusement, mais ce genre d’élément de la nature qui semble magique est mieux dans mes pensées de toute façon. Pour moi, c’est assez de savoir qu’ils sont réels quelque part sur la planète. Alors sur son chemin, Charles rencontre des amis qu’il se fait un plaisir d’aider. En fait, il ne demande rien aux animaux en retour, alors qu’il aurait pu leur demander de l’aide lui aussi. Ses actions sont honorables. Un très beau livre qui mérite d’être lu. Cute story, cute characters, cute illustrations! All about this cute book is cute! The colors used in this book was my favorite! The light wintery tones of purples, blues, and reds were gorgeous! Any books illustrated with foxes--send my way, they are the cutest animals! I enjoyed this sweet story as well and I liked Charles wants to find a wish tree. His brother and sister don't believe there is such a thing, but his trusty companion Boggan is ready to join Charles on a journey to find out. And along the way, they discover that wishes can come true in the most unexpected ways. Young Charles and Boggan head out in search of a wish tree. His siblings say there is no such thing, but Charles believes. They scour the country side, helping squirrels, beavers and many others along the way. As nightfall nears, Charles becomes tired and Charles can no longer search. Boggan carries him, while the animals pull them along. Snow appears, and so does a wish tree! An imaginative story of a boy who believes and perseveres on his quest to find a wish tree. It’s filled with delightful w Young Charles and Boggan head out in search of a wish tree. His siblings say there is no such thing, but Charles believes. They scour the country side, helping squirrels, beavers and many others along the way. As nightfall nears, Charles becomes tired and Charles can no longer search. Boggan carries him, while the animals pull them along. Snow appears, and so does a wish tree! Charles is on a mission to find the wish tree even though his brother and sister both doubt one exists. He spends the day outside with his toboggan helping forest animals carry various loads of materials and just when he runs out of energy to finish his quest, he finds that the forest animals return the many favors Charles did them by pulling his toboggan to the wish tree and preparing a feast for all to share. A sweet story with a lovely ending all imagined in delightfully snowy digital illustra Charles is on a mission to find the wish tree even though his brother and sister both doubt one exists. He spends the day outside with his toboggan helping forest animals carry various loads of materials and just when he runs out of energy to finish his quest, he finds that the forest animals return the many favors Charles did them by pulling his toboggan to the wish tree and preparing a feast for all to share. A special, special book. Beautiful and genuine. What was his wish? I wonder! The artwork is what made me buy this. It is beautifully delicate. I love all books that end with a surprise party especially when it involves forest creatures. Also loved the maplike, scrolling lines the toboggan made in the snow and liked its name was Boggan. This was a super sweet little story with wonderful illustrations. I think it would be a hit with little listeners. I might try it as a read aloud with my Kindergarteners. A wonderful, and perhaps imaginative, day that a young boy has with his toboggan and a forest full of animals. A scene of a winter's forest feast is a particular highlight. From the time I first read a picture book written by Kyo Maclear- I believe it was Spork a number of years ago!- I have been a major fan of her work. Every time I hear or see the news that the author has a new book out, it is immediately added to my must-read list. 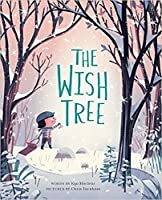 The Wish Tree- written by Kyo, and the illustrative debut of Chris Turnham- was, of course, included right away on my reading list! Now, in the interest of full disclosure, I will say that I had the absolutely pleasure of meeting Kyo recently for a library event. The event was for a talk about her background, her picture book process, and her latest picture book, The Wish Tree. It was one of those surreal and wonderful moments for me (as a book enthusiast, reviewer, librarian, lover of books) to meet someone whose work I've held in high esteem for years! Now back to my thoughts on The Wish Tree...! In the opening of The Wish Tree, we meet Charles and his friend Boggan (a smiling, thoughtful toboggan). Charles is on the search for a wish tree, and while his brother and sister do not believe such a thing exists, Boggan thinks there must be such a thing. So off the two of them go together, deep into the snowy woods. On their way to find a wish tree, Charles and Boggan kindly stop to help animals in need: they help beavers gather birch wood, they help foxes gather berries, and they help a squirrel bring hazelnuts to his home. While it seems as though Boggan and Charles will never find their wish tree before night falls, something wondrous happens involving the animals they have helped that leads to the final search for their wish tree and a celebration in the wintry woods. Chris Turnham's illustrations- engaging and darling, with an eye for both detail and background- are a terrific match for Kyo's quietly rhythmic, beguiling text. Just one look at Boggan's cheerful can-do face against the backdrop of the snowy woods, with he and Charles singing their song together is but one prime example of how the two artists have melded their vision together. A delightful tale with a dose of magical elements, The Wish Tree is a also a story where parts are left up to the reader and/or listener; certain elements involving Charles' and Boggan's journey to the wish tree and the time with the animals are free to the imagination and thoughts of the reader. I initially had some doubt about how, about two-thirds of the way in, the story seems to swiftly shift gears to the even more fanciful and dreamlike. However, upon rereads and reflection, I find myself more and more appreciative of the wondering and open nature of the story's climax and end. Overall, The Wish Tree is a winsome picture book about kindheartedness and wonder. It could make for a great seasonal read aloud, a cozy quiet read, or for an on-theme read about friendship and thoughtfulness...and it may even inspire some to create their own variations of a 'wish tree'! Readers who have already read and loved Kyo Maclear's previous titles will undoubtedly enjoy this. Readers who love the slightly fantastical and lovely in their picture books- along the lines of Extra Yarn, Lenny & Lucy, or The Tea Party in the Woods- might especially savour this enchantingly told and adorably illustrated book. One day a boy named Charles sets off with his sled named Boggan to find a wish tree. His sister and brother say there’s no such thing, but he’s certain it exists. As Charles sets off on his adventure he sings a little song and Boggan sings his own song while swishing through the snow. Together they search up on the top of a hill, through the forest, over a pond, and all through a meadow before they find what they are looking for. Along the way they meet and help out lots of animals that live in t One day a boy named Charles sets off with his sled named Boggan to find a wish tree. His sister and brother say there’s no such thing, but he’s certain it exists. As Charles sets off on his adventure he sings a little song and Boggan sings his own song while swishing through the snow. Together they search up on the top of a hill, through the forest, over a pond, and all through a meadow before they find what they are looking for. Along the way they meet and help out lots of animals that live in the wilds, and the animals return the favor by helping Charles. The Wish Tree with words by Kyo Maclear and illustrations by Chris Turnham is a sweet tale about a boy who follows his heart and ends up getting so much more than he set out to. As Charles searches far and wide, his good nature leads him to notice the creatures he encounters and use his trusty toboggan to help them out. Illustrations are muted, reflecting the warm and cool colors of winter. Bare tree branches and fields of snow are punctuated with pops of red, representing Boggan, squirrels, berries and a fox. The atmosphere seems to have a warm glow of cozy winter times. It’s perfect for cuddling up to read with your three to six year old. The Wish Tree by Kyo Maclear is a contemporary realistic fiction children's book. This book could have a wide age range of readers from 3 years old up through elementary. This a simple sweet story that embodies the holiday spirit without any typical christmas celebrations. Charles decided he wanted to find a wish tree so e take is boggan on a journey to find one. On their journey they come across multiple animals that need help, so he helps them. His day continues and he helps more and more anim The Wish Tree by Kyo Maclear is a contemporary realistic fiction children's book. This book could have a wide age range of readers from 3 years old up through elementary. This a simple sweet story that embodies the holiday spirit without any typical christmas celebrations. Charles decided he wanted to find a wish tree so e take is boggan on a journey to find one. On their journey they come across multiple animals that need help, so he helps them. His day continues and he helps more and more animals and he gets tired of looking and falls asleep on his boggan. The animals return the kindess and pull him to where he find his wish tree, where he finally gets to tie his wish on a piece of paper to the tree. Did you have a special tree growing up? We did, in fact each of us had one tree on our property that we considered ours. A place we would climb in and play under. That's why I love The Wish Tree by Kyo Maclear. It was a reminder for me of days spent high up in the branches wishing and imagining. One day Charles and Boggan set out to find a wish tree. They went up and down together and along the way saw many different animals in need of help but no wish tree. They took the time to help the animals Did you have a special tree growing up? We did, in fact each of us had one tree on our property that we considered ours. A place we would climb in and play under. That's why I love The Wish Tree by Kyo Maclear. It was a reminder for me of days spent high up in the branches wishing and imagining. One day Charles and Boggan set out to find a wish tree. They went up and down together and along the way saw many different animals in need of help but no wish tree. They took the time to help the animals. They walked and search until they could not go another step and then something magical happens. This review has been hidden because it contains spoilers. To view it, click here. Maclear, K. (2016). The Wish Tree. San Francisco, CA. Chronical Books. Chris wants to find a wish tree but both his brother and sister tell him that there is no such thing. He goes on a long journey looking for it and grows tired and stops to rest. When he wakes up right in front of the wish tree where he then writes down his wish and hangs ties it to a tree. This is a cute book with the central theme of not giving up. The textual reputation and the digital illustrations are well-composed throug Maclear, K. (2016). The Wish Tree. San Francisco, CA. Chronical Books. This is a cute book with the central theme of not giving up. The textual reputation and the digital illustrations are well-composed throughout the book. This book follows the standard explore-and-find-many-animals type story method. A boy and his sled (Boggan) set off to find a wish tree, whatever that is, and on the way the encounter and help several animals. When they do find the wish tree, the boy ties a hand written wish to the tree, and then there is a feast with the animals. I was left with many unanswered questions. "Where Charles went Boggan followed. Where Boggan went Charles followed." A boy and his sled go in search of a wishing tree, even though Charles' brother and sister tell him such a thing doesn't exist. Along the way, Charles and Boggan find animals in need of help, which they provide. They, in turn, help Charles find the Wishing Tree. But the true gift are the friends and the caring that happens to them along the way. It was sweet how Charles and Boggan helped all the animals along their search for the Wish Tree but I think I just couldn’t wrap my head around the toboggan having a name and Charles talking to it because the way it looks in the illustrations is just too inanimate for me to picture it as a character. I would have guessed they would give it some personality on the illustrations because the boy gave it a name and talked to it the whole trip, even though it’s obviously an inanimate object.